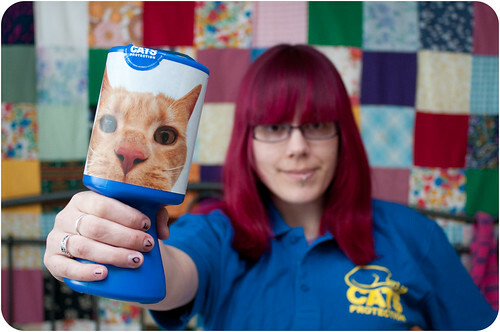 On Friday I’m doing my first shift collecting for the Cats Protection. The CP do a huge amount of wonderful work in the UK, rescuing cats, running neutering schemes and generally being awesome with kitties who need help. Even if you can’t afford to donate there are still lots of other things you can do. There are local branches all over the country which need volunteers to do all sorts of things like help in their charity shops, collect money, help with fundraising etc. Check out what they’re doing in your area and get involved! You can also ‘like’ them on Facebook to keep up-to-date with their work. There are so many cats out there that aren’t as lucky as mine or yours and need help. If you can, please do something to support the CP or your local cat charity if you’re not in the UK.